Yucca Mountain Record of Decision (ROD): On April 8, 2004 DOE published a Record of Decision (ROD) in the Federal Register that announced the selection, both nationally and in the state of Nevada of the mostly rail transportation mode for the shipment of 70,000 metric tons of SNF and HLW to Yucca Mountain, Nevada. 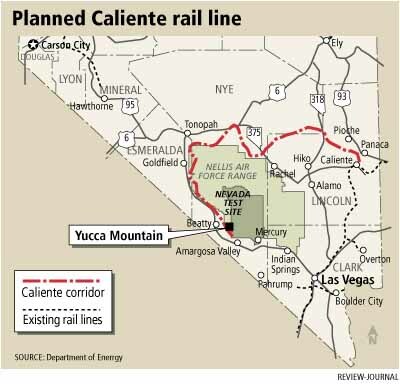 DOE also decided in the same ROD to select the Caliente rail corridor in which to examine possible alignments for construction of a rail line that would connect the repository at Yucca Mountain to an existing main rail line in Nevada. 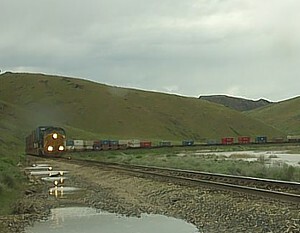 A Notice of Intent to develop a Rail Alignment EIS was subsequently published on the same day in the Federal Register. The Rail Alignment EIS will consider alternative alignments within the Caliente corridor for construction of a rail line within Nevada. That EIS was published on October 2007. Of note, in a March 2004 supplemental document, DOE revealed that legal-weight trucks might be used to ship casks of waste on existing Nevada highways for up to 6 years while the rail line is under construction. Under this scenario, waste would be shipped on existing rail lines across the U.S., then transferred to trucks at intermodal stations in Nevada. 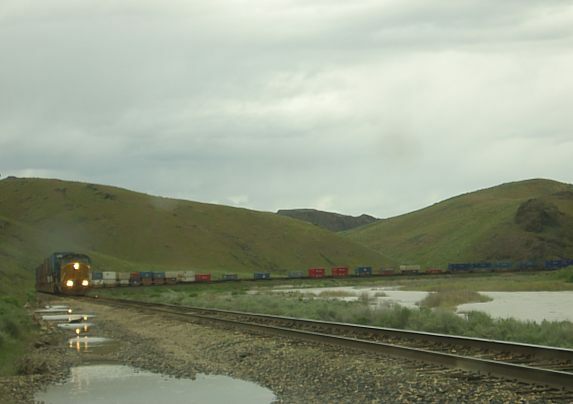 BLM's land withdrawal may cement the Energy Department's access to the proposed rail route. According to BLM, the land withdrawal will prevent mineral prospectors from filing mining claims along the route and will deter BLM from selling any of the land or allowing other federal agencies to make use of it. It's worth noting that current valid mining claims, grazing rights, water rights and public access to the land will not be affected. Of interest, the withdrawal will expire 10 years from the effective date of the order (12/08/2005) unless, as a result of a review conducted before the expiration date pursuant to section 204(f) of the Federal Land Policy and Management Act of 1976, 43 U.S.C. 1714(f) (2000), the Secretary of Interior determines that the withdrawal should be extended.